$1.75 Per Sq. Ft. NNN / Mo. $1.16 per Sq. Ft. / Mo. 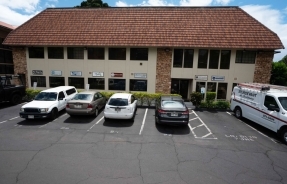 Rare small office available in a two-story office building in the heart of Lahaina Town. Amenities include elevator service, reserved parking, men and women’s restrooms on each floor, and onsite property management. Located in West Maui, in the downtown Lahaina retail district, a block from Front Street. The property is within walking distance to Lahaina Harbor, shops and local schools. Convenient access off Highway 30.